Why it is all important with HACMP/PowerHA software? Because it is implemented as normal shell scripts and some RSCT processes which are mostly not running in kernel mode at all (at least everything below PowerHA 7.1)! The only way PowerHA/HACMP can give more CPU horse power to the processes needing is to give them higher priority on the run queue, just take a look on the PRI column..
Ok, this is part III of the rather long story. As shown in last series the problem was really tricky, we cannot run anything in the event of loosing storage (you cannot read binaries if you don’t have storage). Ok, so how HACMP/PowerHA deals with it? en_method = "/usr/es/sbin/cluster/diag/clreserror $9 $1 $6 $8"
#   Fallover triggered by (AIX) Error Notification. #   This function is merely a wrapper for clRMupdate. #   Argument validation is performed in the clRMapi. #       Argument validation is performed in the clRMapi. And rest assured that this script calls a lot of other scripts, of course that can be unavailable if the rootvg is on the same physical storage as the affected VG. to a multiple of 4096 bytes. Second finding is that even with all those changes it has very high probability of failing (i.e. PowerHA RG move won’t work). Personally the risk is so high that for me it is nearly a guarantee. The only proper solution of this problem that i am able to see is to add special handler to the err_method in errdemon code. Something like err_method = KILL_THE_NODE. This KILL_THE_NODE should be implemented internally by running all the time errdemon process. The process should be running with memory protected from swapping (something like mlockall())… because currently it is not running that way. Ok, this is part II of the post PowerHA failure scenario when dealing with SAN-booted LPARs – part I.
A6DF45AA   0103071111 I O RMCdaemon      The daemon is started. OK, but we wanted to have a real proof, so we have performed a double-check. We suspected that VIOS can have some magic way to communicate with LPAR. We wanted exclude that factor, and we’ve performed simulation of disconnecting the FC from storage level. The initital state was stable HACMP cluster, with RG active on jkwha002d (and jkwha001d being passive), all MPIO paths to Netapp cluster (storage1, storage2) were reported as “Enabled” by “lspath”. The igroup term in Netapp concept is “inititator group” and is responsible for things like LUN masking. If you remove access to some FC WWPNs on the LUN, it is going to end-like in situation in which AIX will have hdisks point to non-existing SCSI adapters and AIX SCSI stack will get a lot of errors (FC is just wrapper around SCSI). bash: /usr/bin/topas: There is an input or output error. bash: /usr/bin/nmon: There is an input or output error. but what’s most interesting is that Oracle will ask AIX to write it to the alert log file – and will be available to read by commands like “tail”, but “cat” command won’t work (you won’t be able to read whole alert log file becasue you don’t have I/O!). What’s even more interesting is that you won’t see those messages after rebooting! (after kernel memory is gone!). If you don’t have I/O how you are going to write/fsync this file??? Another additional thing is that the active HACMP node still will be active, it will be handling Resource Groups, etc. Failover won’t happen. Possible solutions to this problem should be an kernel-based check that would verify that at least /etc is accesible. Why kernel-based? Because you have to have some form of heartbeat in memory (like AIX kernel module or uncachable binary always present in RAM, running in Real-Time scheduling priority) that would continuesly . If it would fail for several times it should reboot the node (that would trigger Resource Group failover to 2nd node in the cluster). Note: typical HACMP scripting – at least in theory – is not enough, even if it would force running /sbin/halt, how can you be sure that /sbin/halt all required libc contents are in memory?? Together with Jedrzej we’ve exposed rather interesting weaknees in IBM PowerHA 5.5 solution (in the old days it was called HACMP). Normally you would assume that in case major cataclysm such as *complete* storage disappear on the active node, PowerHA or AIX has internal mechanism to prevent downtime by switching the services to the next active node (as defined in PowerHA policies/confguration). This is starting to be really interesting when we start talking about SAN BOOT-ed AIX LPARs. As everybody knows any form of assumption is bad (this is starting to be my mantra), and as we show it here avoid this pitfall requires requires SOME PLANNING AND CONFIGURATION to avoid ending in long downtime…. Two LPARs (jkwha001d = active; jkwha002d = passive) running on separate Power frames. Each LPAR on each frame was protected by separate pair of VIOS (to provide redundancy for NPIV-enabled FC fabrics and enable to have Shared Ethernet Failovers). Simulating total storage losing only on jkwha001d (active one, hosting Oracle) by unmapping Virtual Fabre Channel (NPIV) host adapters (vadapters) on both VIOS protecting jkwha001d. Simulating total storage losing only on jkwha002d (active one, hosting Oracle — after failover) by forcing disconnection of jkwha002d Fibre Channel initiators (WWNs) on Netapp cluster. This is going to be a rather short blog post. 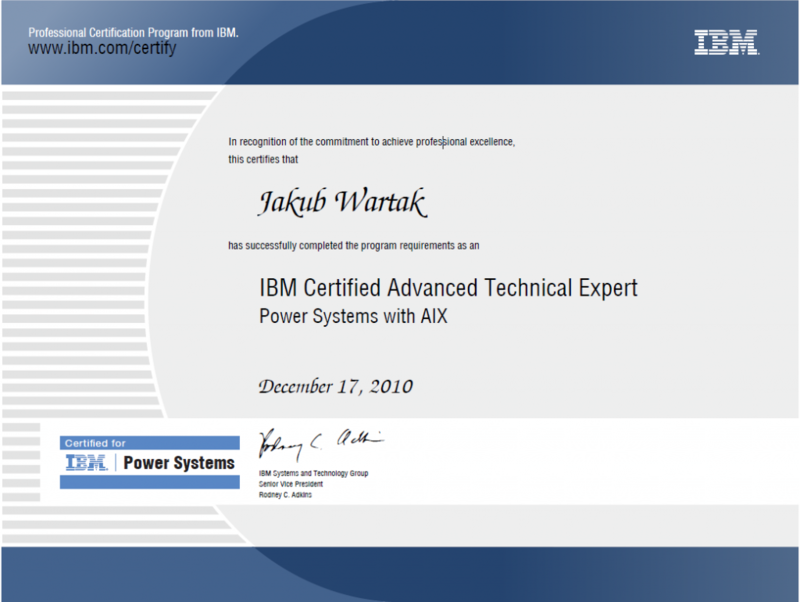 On 17th of Dec last year (2010) I’ve passed all of the pre-requisites (5 other IBM certificates) for being “IBM Certified Advanced Technical Expert – Power Systems with AIX” (the highest [master level] credential for people working with & designing solutions with AIX, VIOS, PowerHA/HACMP, PowerVM, (D)LPARs, Linux on Power, etc)). 1) you won’t pass the required tests/certifications if don’t know this stuff deeply (each technology like PowerVM, PowerHA – at the expert level – doh! you want to be ‘Advanced Technical Expert’!). 2) deep AIX knowledge alone is not enough. You need to get the big picture and be interested in integration of everything that plays with AIX so this includes applications, storage, high-availbility, disaster recoveries, business requirements, a lot of experience of how everything interacts, etc. You need a lot of experience (years of them).